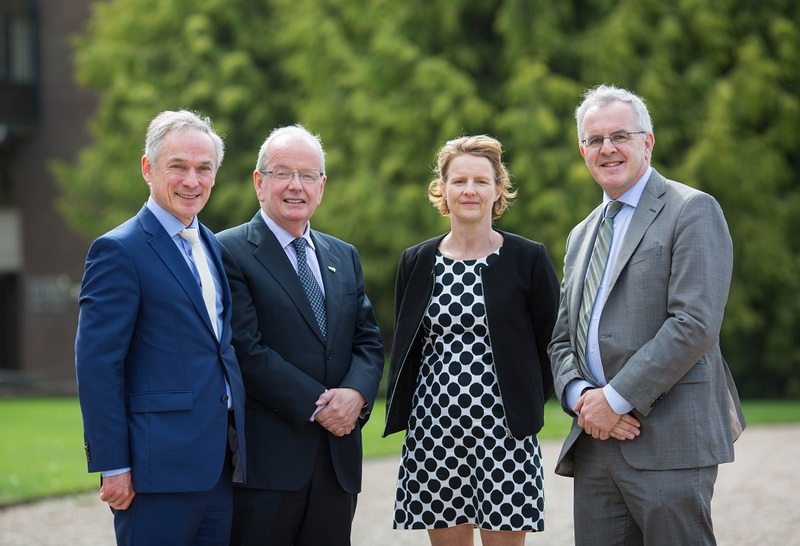 Pictured at the launch of the new post graduate qualification in school leadership at UL were: Minister for Education and Skills, Richard Bruton TD; Dr Des Fitzgerald, President of UL; Dr Ann Ledwith, director of Continuing and Professional Education UL; and, Professor Paul Conway, course director UL. Photo by Alan Place. The Minister for Education and Skills, Richard Bruton, TD has officially launched a new Professional Diploma in School Leadership at the University of Limerick, aimed at those aspiring to senior leadership positions in primary and secondary schools. The establishment of this programme forms part of the Government’s Action Plan for Education (2016-2019) and it aims to develop leadership capacity in Irish Primary and Post Primary Schools. Developed at UL in partnership with NUIG, UCD and WIT and jointly awarded by NUIG, UCD and UL, this programme is funded by the Department of Education and Skills (DES) through the Centre for School Leadership. The programme is an 18 month, part-time blended learning professional diploma, delivered locally in six regional locations throughout the country (UL, NUIG, UCD, WIT, CIT and St. Angela’s Sligo) and will be administered by the School of Education and Continuing Professional Education at the University of Limerick. There will also be specific provision for teachers in Irish-medium schools through NUI Galway. Other significant aspects of the programme, which will be open to approximately 200 participants annually, will include work placement in a school other than the participant’s own and in a context outside that of education, engagement in reflective practice, collaborative action research and opportunities to work in professional learning communities. Participants will also take a module on mentoring and coaching as leadership tools in Irish education. “I am delighted to announce our new postgraduate qualification in school leadership and our new coaching service,” said Minister for Education and Skills, Richard Bruton. “The quality of the learning environment is critical to how children develop their competences. With changing technology and changing expectations, school leaders are required to operate in a much more complex environment,” he continued. “Success in education is built on the quality of leadership, the ingenuity in teaching, the support in the community for learning. We are lucky in Ireland to have such a dedicated and committed teaching profession, with school leaders of the highest calibre,” Minister Bruton added. The course will be open to approximately 240 participants annually. The online application system is currently open and runs until May 24th, 2017.